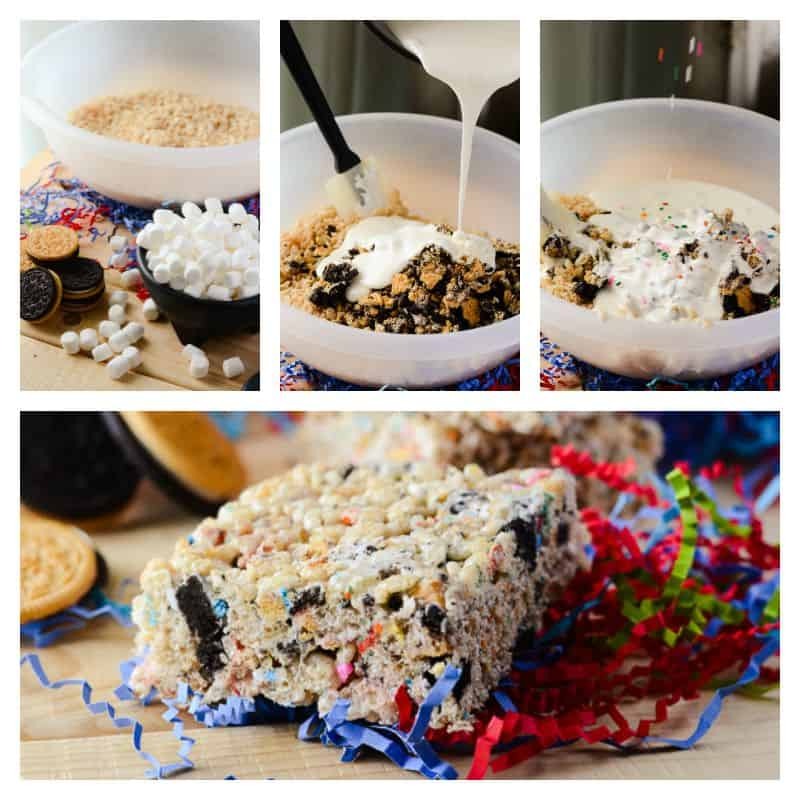 Make going back to school fun with this colorful, Oreo-studded variation of the classic Rice Krispie Treats – or just transport yourself back to childhood! The name alone brings back a rush of memories from my days as a school bus kid. Nana was the best lunch packer this side of the equator, and I always had very balanced meals to look forward to enjoying when the lunch bell rang – an entrée, fruit, and a delicious snack, sometimes store-bought, most times homemade. Her rice krispie treats were KILLER, and I think I’ve figured out her recipe for success. Mr. Crumby and I are still trying to cook up a bambino of our own, but I’m already getting my “Mommy Practice” in now. 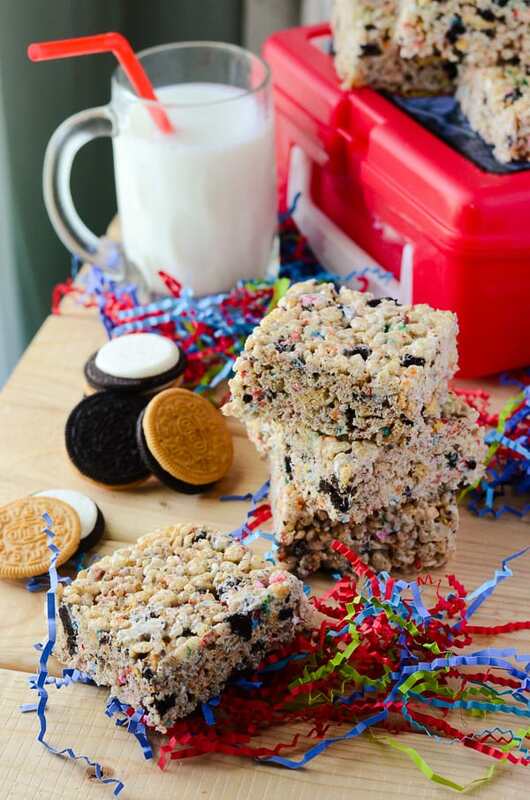 These Oreo Funfetti Rice Krispie Treats absolutely fit the bill, and while they’re not going in any cute plastic lunch boxes just yet, they are being enjoyed by a child – the one in my heart! Guys. If the rice krispie treats themselves didn’t have you sold on a quick walk back through your school days, surely the sprinkles will. C’mon. SPRINKLES. They make everything better. Funfetti was everything back in the day, wasn’t it? At least for me and my friends it was. If your mom brought funfetti cupcakes to class for your birthday, you were absolutely the most popular kid for at least a solid week. Bonus points for multicolored frosting. Just knowing how school policies have changed in the last few years, and parents are no longer allowed to bring homemade treats to their child’s class parties, is absolutely soul-crushing to me. One of the things I’ve looked forward to the most about having kids is spoiling the hell out of them with homemade baked goods, and that especially included baking dozens of cookies and cupcakes for them to share with their classmates. Now, I’ll have to bring in store-bought junk like every other parent. Booooring. Trust me when I say that they’ll still be getting homemade goodies like these in their lunch boxes, though. When I saw this week’s #SundaySupper theme, I knew I had to share a variation of what was my number one after-school snack. The Oreos in these snacks add a tasty, unexpected flavor. Any type would work great – I used the Heads or Tails variety just to mix it up a little, and it’s a nice surprise to bite into a pocket of that famous cookie cream. It took everything I had in me not to eat more than one of these while I was photographing them – they’re so buttery and gooey, and have the perfect Krispie Treat consistency! Your kids will love them, and I promise you will, too! 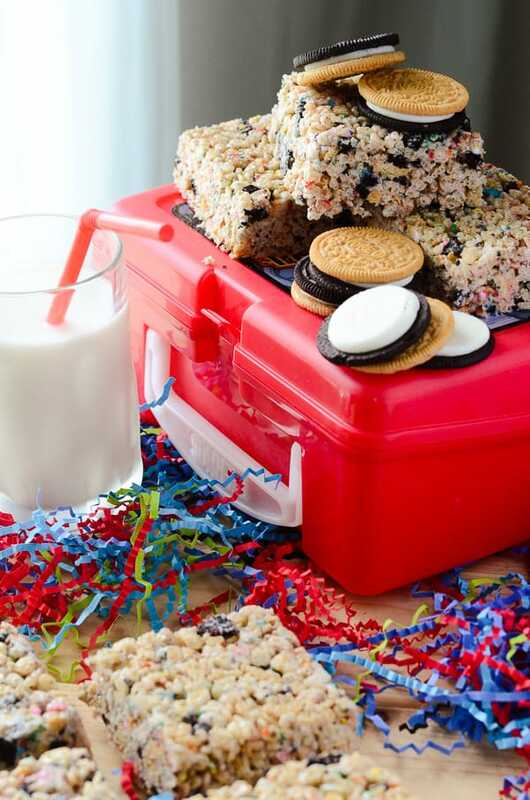 Make going back to school fun with this colorful, Oreo-studded variation of the classic Rice Krispie Treat - or just transport yourself back to childhood! Liberally butter a 9x13 baking pan. Set aside. Combine cereal, crushed cookies, and sprinkles in a large bowl. In a saucepan set over low heat, melt butter. Add marshmallows and stir with a rubber spatula until marshmallows are completely melted and smooth. Pour melted marshmallow over cereal and stir until everything is completely coated and begins to clump. Transfer mix to prepared baking pan and gently press treats down, creating an even layer. Allow treats to cool completely (35-60 minutes) before cutting into 12-16 squares. Treats are best enjoyed the same day. Wrap any extras in plastic wrap - they're great in lunchboxes! Which snack makes you nostalgic for your childhood? Ready to start planning lunches? Draw some inspiration from the #SundaySupper crew – we’ve got everything covered! 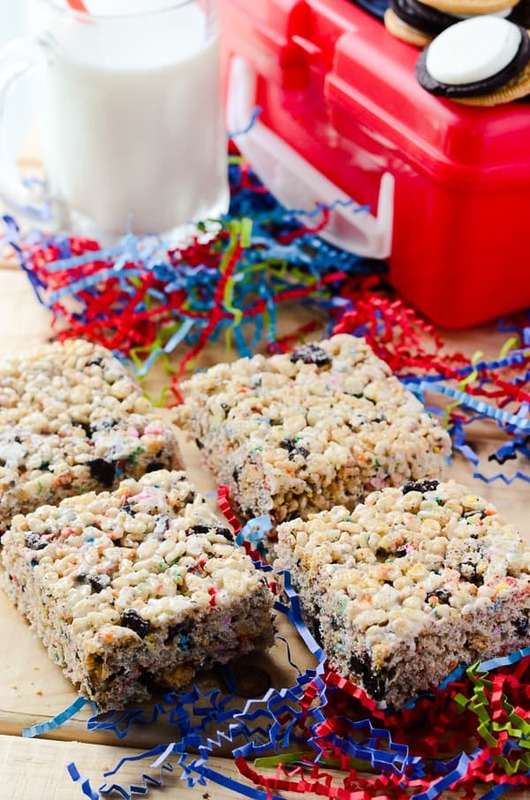 Great yummy idea, those would be a super hit in the lunch box or after school!! Oh no, you can’t bring homemade treats to school anymore? That’s such a bummer. Bringing in birthday treats is one of the only good memories I have from school. I love RKTs. I still make them all the time … but never any this fun. Little Debbie Oatmeal Pies or Star Crunch make me nostalgic for my school days. 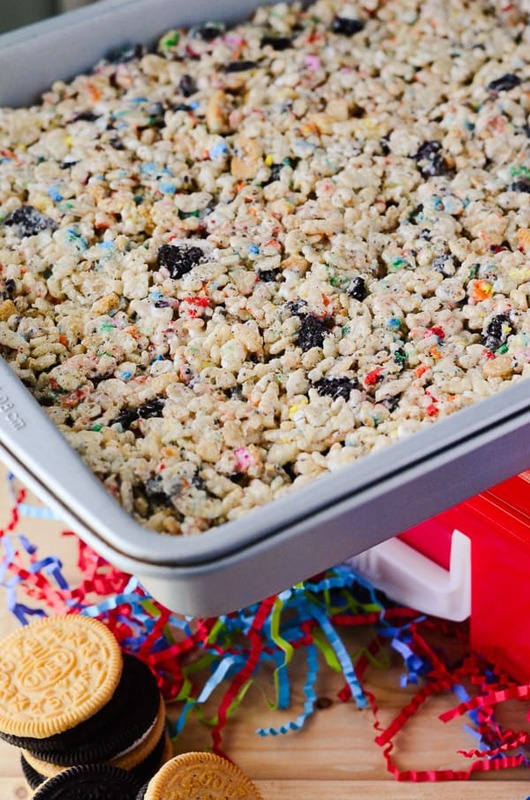 What a festive batch of krispie treats you made. Nice color and flavor too. You has me at rice krispie treats! Yum, what a great recipe! These are so much fun! Love! These look amazing and so festive! My son loves rice krispie treats! I will have to try this recipe soon! Wow,just looking at theses pictures give my sugar rush. I definitely have to try theses this weekend. These are fun!!! Love the colors. I have rice krispies that are begging me to make them. 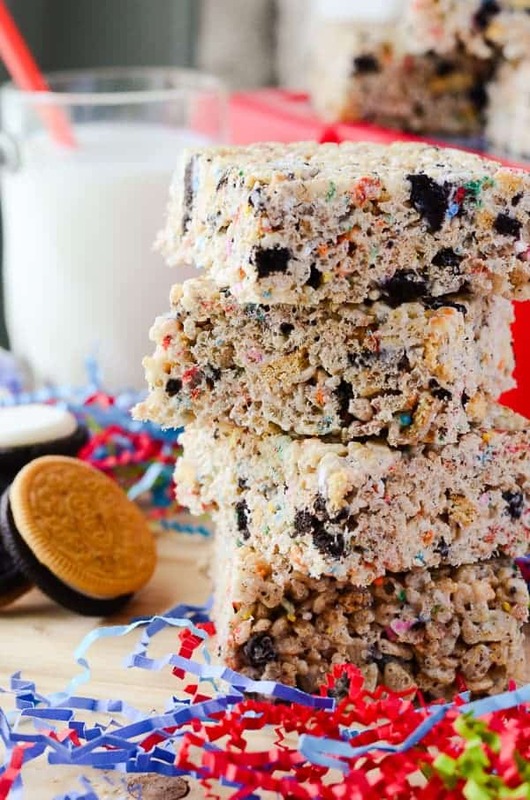 Oreos AND Rice Krispy treats — who knew each could get better than it already is?? Well done and I love your story too! Love how color-full these are! I bet they taste really good too. Will have to make some of these for a kid’s event I have in September. The girls at work would love these! The colors add so much fun! That is fun just to look at. Bet it is tasty also. Trying to stay away from sweets and this is very tempting!!! OMg. That looks too yummy. Gotta make it!! Oh. My. Gosh! I love rice krispie treats, but these are on a whole nother level! I totally have to try them! I love funfetti anything! From cupcakes, cakes, donuts, and not rice krispies too? I’m excited to make this, it’s reall easy thanks for the pictures and the ingredient list! These look absolutely sinful and delicious! I unfortunately can’t eat them due to my intolerances but you best believe I will be making these anyways for my family and friends for our next get together! Thanks for the recipe! Kids and kids at heart will truly love your recipe. Thanks for sharing this! thanks! 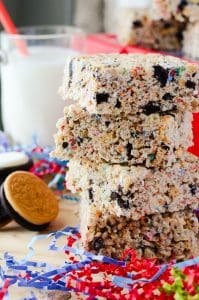 I love rice crispy treats .These look amazing!! That looks so pretty and delicious. I can’t wait to make this for my kids. These look all sorts of tasty!!! I so need to make these myself! Yummy! These looks amazing! I am totally craving some now. Those look so fun! I am sure my kids will love them! This sweet treat looks gorgeous…and your photos also! Pinned this! I think will be great for Halloween :P.
Thanks, Sinziana!! These WOULD be awesome for Halloween – so many possibilities! Okay you had me at Oreo AND funfetti… YUM. Okay, seriously?! 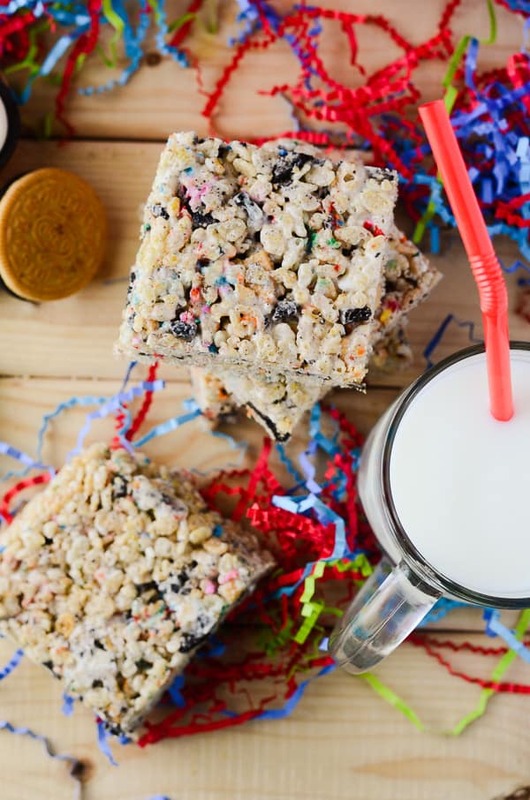 These are the coolest rice krispie treats EVER!